Author Aaron LaPedis is considered one of the world’s great collectors and treasure hunters. A gallery owner with an interest in fine art and memorabilia, LaPedis is often called upon by the FBI for his expertise in various fields. The second edition of his award-winning book, The Garage Sale Millionaire, was recently released in a revised, hardcover edition published by Wiley. The revised and updated 3rd edition is coming soon! LaPedis was the host of Collect This!, Public Broadcasting System’s (PBS) seven-year, #1 rated show in Denver, Colorado. His show reached 100,000 viewers every weekend within the state of Colorado as well as 1.5 million viewers nationally each month. LaPedis successfully taped more than 50 half-hour segments focusing on the diverse world of collecting. Some of the varied topics discussed include coins, wine, art, animation and sports memorabilia. LaPedis’ expertise on these subjects has made him an extremely popular and sought-after public speaker. His thoroughly personable and informative style educates his audiences in the many ways of becoming a successful collector and treasure hunter. LaPedis’ expert credentials do not just stop with his PBS show. He has been interviewed by network television and radio as well as having been featured in books, newspapers and magazines. 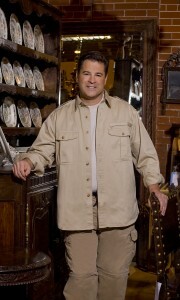 The Discovery Channel produced a half-hour show on LaPedis’ numerous and detailed collections and called on his expertise when filming their television special, What’s America Worth, hosted by Donald Trump. Entrepreneur Magazine highlighted LaPedis’ success as a master collector and successful entrepreneur. LaPedis is also a columnist for The Denver Post and has written for The Denver Business Journal. He has hosted a weekly four minute segment on the local Denver ABC affiliate, KMGH, called The Collectibles Guy and is a monthly guest on the top rated radio program Money 101 with Bob McCormick. Most recently, LaPedis was featured on Hallmark Channel’s Home and Family, hosted by Mark Steines. He has also just recently appeared on Yahoo.com, increasing his total number of front page appearances to three.